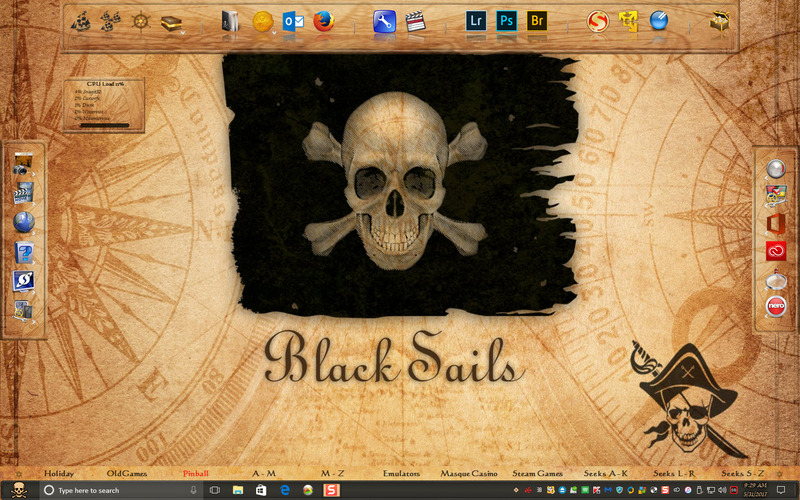 This is a full Winstep Extreme skin to compliment LightStar's Black Sails WB. Please note that the Parchment-style background only looks right at 1680x1050 resolution. If there are enough requests, I can provide backgrounds for other resolutions, as well. Dig in, me hearties! Very nice theme sir. However, for some reason, I cannot import it into WinStep. I keep getting "Error importing theme file." There is nothing unusual about my computer setup or my WS installation and I've never had a problem importing other .xtreme files. I've tried changing it to a zip file and I got Invalid archive. werewolf, I've uploaded a working version. I'm not sure what went wrong, but this should do it. Thanks Robert. Really looking forward to having this on my desktop. Annnddd.... There it is. Wow this really looks great with the WB. Thanks again sir. Good job. Glad you like it, werewolf!